The Federal Circuit has updated its original decision in Asetek, with Judge Prost deleting her dissent and her points being incorporated into the majority opinion. The change here relates to the injunction pending remand. 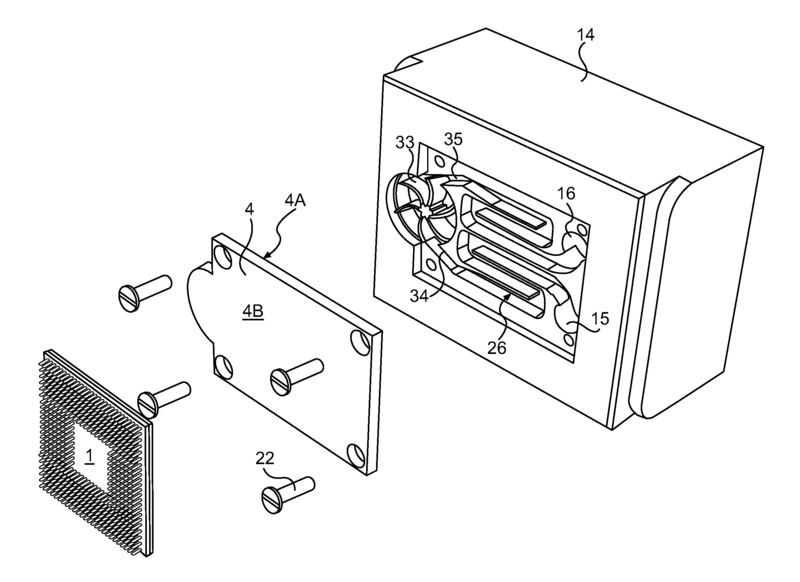 Asetek sued CMI/Cooler-Master for infringing its computer fan patents. U.S. Patent Nos. 8,240,362 and 8,245,764 (“cooling systems”). A jury sided with Asetek and the patentee was awarded damages as well as an injunction against specific Cooler Master products. The problem – is that the injunction was awarded against CMI USA as well as “Cooler Master Co., Ltd.”, a Taiwanese company who was no longer a party to the lawsuit. On appeal, the Federal Circuit substantially affirmed but remanded on the injunction since it applied to a non-party and went beyond that non-party’s ‘abetting a new violation’ by the adjudged infringer. Two final, related points. First, the need for further proceedings to determine the proper reach of the injunction in this case leads us to vacate the injunction, effective upon issuance of our mandate, insofar as the injunction reaches conduct by Cooler Master that does not abet new violations by CMI. The district court is to conduct those proceedings in as reasonably prompt a fashion as possible. Our partial vacatur of the injunction does not foreclose Asetek from pursuing reinstatement of the vacated portion of the injunction should there be unjustifiable delay by Cooler Master in completing the proceedings, or from pursuing any other remedies against Cooler Master, if otherwise authorized by law. The Panel Majority’s precedential opinion has promulgated a new rule that a pre-liability permanent injunction against a non-party is permissible pending a determination of liability under the “legally identified with” theory. There are three issues with this opinion. First, it violates the rule that everyone has a right to his day in court. Second, it violates the rule that actual success on the merits must precede entry of a permanent injunction. Third, its remand of further proceedings to determine the “legal identity” issue is an impermissible advisory opinion. I believe that the revised decision here is legally correct, but it always gives me pause to watch companies and owners divide-up the structure of their firms without substantially dividing management and control — and then use that division to partially avoid legal liability. The end result is that the potential corporate complexity can substantially raise the costs of enforcement without providing any social benefit. In this case, Asetek writes that “the precise historical and corporate relationship between CMI and Cooler Master is murky; not even their counsel is sure of it.” The parties always had the same attorneys, and CMI distributes all of Cooler Master’s products in the US, and assists with US marketing.